“Fixes that Fail” is one of the archetypes of systems dynamics – common patterns which we see in organizational change. 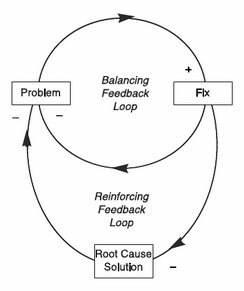 It is probably the simplest of the systems archetypes, with just two feedback loops – the balancing loop where we fix symptoms (not root causes) and the reinforcing loop where the fix actually prevents us from finding a root cause solution or, in some instances, makes matters worse. But how do we know we are dealing with symptoms rather than root causes? The simplest lean approach is to ask Why? 5 times when looking at the problem. This leads us towards root cause solutions rather than symptomatic ones. The Six Sigma discipline teaches us to ask if the symptoms are indeed symptoms of any change, or just normal variation. The first question we ask is not ‘what is happening?’ but ‘has anything happened?’. One reason fixes fail is that there wasn’t anything to fix in the first place – it was just the natural variation of the process. The only way we can know if something has happened in a process is if we understand the normal variation of the process, usually by control charting key variables. Once we know that a process is in control, we can then identify if it is changing; otherwise we may just be responding to noise in the system. It is perfectly possible for a process to be in control but intermittently fail to meet customer requirements. Reacting to that failure by performing root cause analysis is beside the point – we know that the process isn’t capable of meeting customer demand all the time, so we should improve the process to make it capable rather than treat individual failures as special causes which require root cause analysis. Irrationality (or madness) is often defined as doing the same thing and expecting a different result. Process control tells us that irrationality is reacting to normal variation as if it were a different result. There are two reasons fixes might fail; one is that you have only fixed the symptoms not the root cause, but often the reason might be that there was nothing to fix – you were just reacting to natural variation.